The Multi-line Decorative Foot is designed to help you create parallel rows of decorative stitches that are evenly spaced. The clear view through the foot gives greater visibility and helps to precisely align the rows of stitching. Use the vertical guidelines to evenly space your rows and the horizontal guidelines to match your starting points and accurately turn corners at ¼" (6mm) or ½" (12mm) intervals. 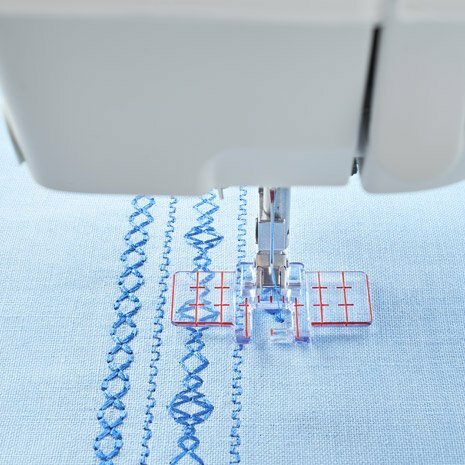 The Multi-line Decorative Foot can also be used as a guide when sewing Maxi stitches.